I have a yellow diplandia plant it is on the East facing upper deck, it gets morning and early afternoon sun. It has a lot of buds on it but I have noticed that they dry up and never come to flower. What is wrong? I keep the soil moist, does the plant need to be misted? Your Diplandia (or Mandevilla splendens) does not need to misted, in fact it sounds like your are caring for it properly. The idea conditions for Mandevilla is moist but well-drained potting soil, in full-sun with protection from afternoon heat, water moderately and apply a balanced liquid fertilizer each month. 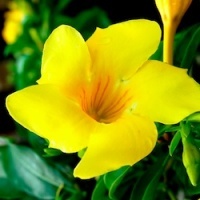 Mandevilla are tropical plants and do not tolerate cold well, is it possible your flowers are getting too cold at night? Perhaps it is too early in the season for your plant to be outside in your particular climate. Hope this helps, happy gardening!